Herbert Clark Hoover (1874 – 1964) was an American politician who served as the 31st President of the United States from 1929 to 1933. Hoover, a successful businessman, first came to national prominence in the 1910s due to his work as a humanitarian. Among other things, he helped save millions from starvation during and after the First World War. 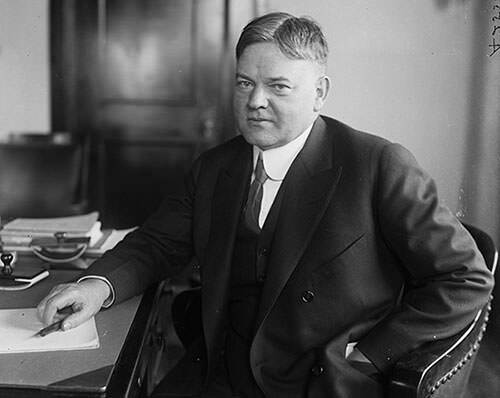 Hoover then served as the U.S. Secretary of Commerce from 1921 to 1928. He achieved unprecedented success in the post raising the stature of the Department of Commerce. As President, Hoover’s domestic policy achievements include unprecedented prison reform; concentration on child health and protection; and the establishment of the Reconstruction Finance Corporation (RFC). In foreign affairs, his Good Neighbor policy improved U.S. relations with Latin American nations. However, despite his contributions, Hoover’s presidency was dominated by the Great Depression and he is mostly remembered for his failure to respond to the crisis. Here are the 10 major accomplishments of Herbert Hoover as well as an excerpt on his response to the Great Depression. At the outbreak of World War I in August 1914, Herbert Hoover spearheaded an effort to ensure the safe return of 120,000 American tourists stranded in Europe. Germany’s invasion of Belgium then led Hoover to pool his money, along with several wealthy friends, to organize the Committee for the Relief of Belgium. Headed by Hoover, the committee procured food for around 9 million Belgians who faced starvation. The efficiency of Hoover in accomplishing the task led to President Woodrow Wilson to appoint him as head of the U.S. Food Administration, which diverted products overseas to American troops. His effectiveness in conserving resources and supplies needed for war made Hoover a household name in America. 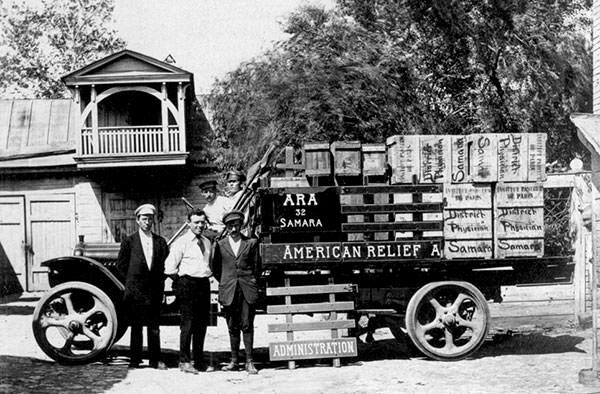 After the First World War, Hoover became head of the American Relief Administration (ARA). In this capacity, he channeled 34 million tons of American food, clothing and supplies to war-torn Europe, aiding people in 20 nations. Herbert Hoover was world renowned as a great humanitarian and he was nominated five times for the Nobel Peace Prize. After winning the 1920 election, Republican President Warren Harding appointed Herbert Hoover as his Secretary of Commerce. Hoover retained this position under his successor, President Calvin Coolidge, thus serving from March 5, 1921 to August 21, 1928. Secretary of Commerce was a minor Cabinet post. However, under Hoover’s leadership, the Department of Commerce became as influential as the Departments of State and Treasury. Hoover encouraged research into measures designed to counteract harmful business cycles. He supported government regulation of new industries like aviation and radio. He brought together more than one hundred different industries and convinced them to adopt standardized tools, hardware, building materials and automobile parts. Finally, he aggressively pursued international trade opportunities for American business. To accomplish these reforms, Hoover strengthened existing agencies or simply established new ones. He also formed commissions that brought together government officials, experts and leaders of the relevant economic sectors to work together towards reform. After the Great Mississippi Flood of 1927, the governors of six states along the Mississippi asked specifically for the help of Herbert Hoover. This led to President Coolidge appointing Hoover to coordinate the response to the flood. Hoover’s efficient leadership during the crisis made his reputation with the American people reach its peak. Thus when Calvin Coolidge decided to not seek reelection, Hoover became the leading candidate for the Republican presidential nomination. 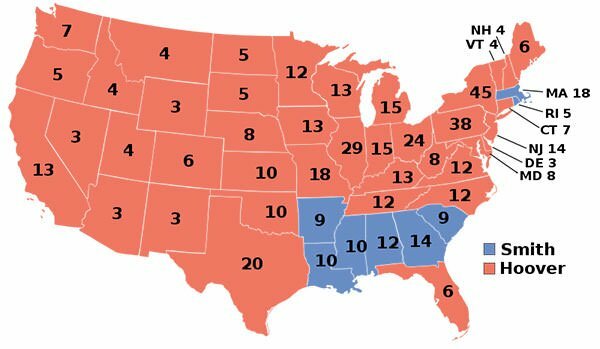 In the presidential election of 1928, Hoover defeated the Democratic nominee, Governor Al Smith of New York. He won the election with 58.2% percent popular vote and 444 electoral votes out of 531. Herbert Hoover served as the 31st President of the United States from March 4, 1929 to March 4, 1933. He sought re-election but was defeated by Franklin D. Roosevelt in the 1932 election. President Hoover increased the federal budget to include children’s programs. In 1930, he hosted the first ever White House Conference on Child Health and Protection. The conference prepared technical findings and recommendations regarding every conceivable childhood concern from prenatal care and a safe environment during childhood to expanded educational opportunities and the promise of health care for the physically and mentally handicapped. To summarize the Conference’s more important recommendations, a Children’s Charter of Rights was prepared. The government was made responsible to obtain and protect those rights on behalf of the nation’s children. 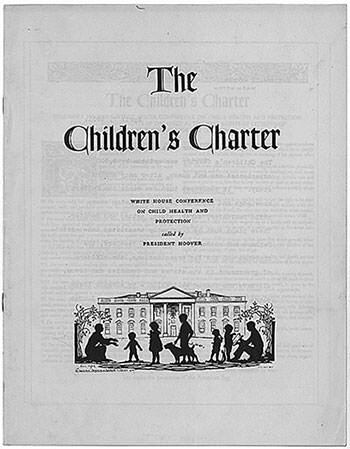 These initiatives were taken forward by the Franklin Roosevelt administration, which took giant steps to fulfill the Children’s Charter developed by Hoover’s conference. Herbert Hoover achieved unprecedented prison reform. Eight bills regarding prison reform were passed by Congress during his presidency. The Federal Bureau of Prisons was established in 1930. Among other things, it eliminated prison overcrowding by establishing work camps and building new penitentiaries and reformatories. A federal school for prison guards was founded and all prison employees were moved under the supervision of the Civil Service Administration. Educational and health benefits for prison employees were improved and prison employees became better trained through a special school. The number of prisoners on parole doubled during the presidency of Herbert Hoover. Herbert Hoover was a conservationist. As Secretary of Commerce, he was the driving force behind such projects as the St. Lawrence Seaway and the Hoover Dam. He also limited oil pollution of coastal waters, protected salmon fisheries in Alaska and standardized lumber to eliminate waste of forest resources. As president, Hoover’s conservationist agenda included finding solutions to overgrazing; building dams; developing water resources; and consolidating national parks and forests. Most prominently, Herbert Hoover made a lasting contribution through the numerous national parks that he established as president. His administration increased appropriations for national park operations from $2.2 million in 1929 to $3.7 million in 1932. During his presidency, three million acres were added to the national park inventory. On March 3, 1931, President Hoover signed into law the Davis–Bacon Act. The Act is named after its sponsors: Senator James J. Davis and Representative Robert L. Bacon. The Davis Bacon Act requires all on-site employees be paid fair wages, benefits and overtime weekly while working on government-funded construction, alteration or repair projects at a minimum threshold of $2,000. It has been updated several times. It continues to impact approximately 20 percent of all construction projects in the United States and affects more than 25 percent of all construction workers in the nation at any given time. 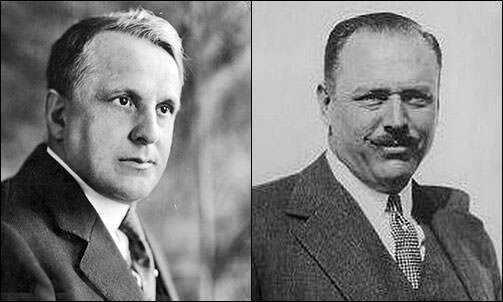 The Norris–La Guardia Act, named after its sponsors Senator George W. Norris and Representative Fiorello H. La Guardia, was also passed during Hoover’s presidency. It banned yellow-dog contracts, or agreements between an employer and an employee in which the employee, as a condition of employment, agrees not to be a member of a labor union. In December 1931, President Hoover proposed the establishment of the Reconstruction Finance Corporation (RFC) and, in January 1932, he signed the bill creating the RFC. 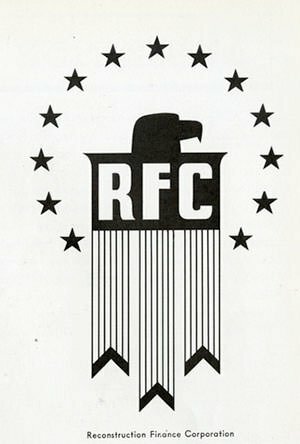 The RFC was a government agency which aimed to provide financial aid to railroads, financial institutions and business corporations. Its scope was later broadened to include aid to agriculture and financing for state and local public works. The RFC saved numerous businesses from failure. The agency also played a major role in recapitalizing banks in the 1930s and it was effective in reducing bank failures and stimulating bank lending. The RFC was adopted by Franklin D. Roosevelt and it was greatly expanded during his presidency. It continued to run till 1957, when the US government decided that it no longer needed to stimulate lending. In total, the RFC gave $2 billion in aid to state and local governments and made a large number of loans, nearly all of which were repaid. President Hoover’s most important success in foreign policy was his move towards non-interventionism in Latin America. Though associated with President Franklin D. Roosevelt, this “Good Neighbor“ policy actually originated with the Hoover administration. After his election in 1928, Hoover embarked on a ten-week tour of Latin America during which he gave speeches which stressed on his plans to reduce American political and military interference in Latin American affairs. He backed his words with concrete action. He removed American troops from Nicaragua in 1932. He signed a treaty with Haiti the same year, promising to end the American occupation by January 1, 1935. He also personally arbitrated a dispute between Chile, Peru, and Bolivia. Hoover’s “Good Neighbor” policy towards Latin America build a solid foundation for his successor. 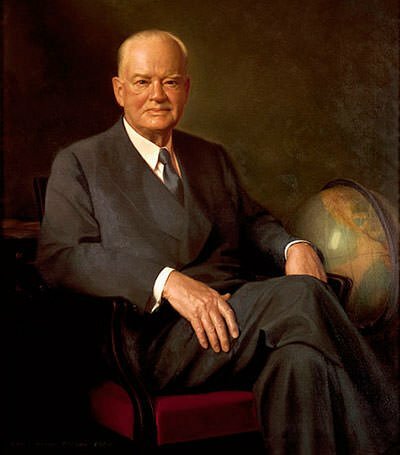 After the Second World War, President Harry S. Truman selected Herbert Hoover to make a rapid survey of world food supplies and needs. Hoover visited 38 countries in 76 days and, when the survey was finished, he urged the food producing countries to increase their food exports to famine‐stricken countries. On the initiative of Hoover, a school meals program in the American and British occupation zones of Germany was begun on April 14, 1947. The program served 3,500,000 children aged between 6 and 18. In total, around 40,000 tons of food was provided to the children. In his final report, Hoover recommended and laid the plan for the formation of an organization within the United Nations to focus attention on the needs of children. This led to the creation of the United Nations Childrens Fund (UNICEF) on December 11, 1947. Hoover, also secured UNICEF’S first contribution of $15 million from the United States. The defining episode of the presidency of Herbert Hoover was the Wall Street Crash of 1929 and the ensuing Great Depression. Hoover pursued a variety of policies in an attempt to lift the economy. Among other things, he implemented protectionist trade policies and raised U.S. tariffs on over 20,000 imported goods. However, America’s trading partners retaliated by raising their tariffs. All this led to reduction of American exports and imports by more than half. The policy thus backfired and worsened the Depression. Although some of his measures like the establishment of the RFC provided some relief, Herbert Hoover largely failed in handling the Great Depression. The economy kept falling and the unemployment rate rose to 25%. This ultimately led to his landslide defeat in the presidential election against Franklin D. Roosevelt.